4-D printing at the MIT Self-Assembly Lab: The future will build itself. How the future will build itself. 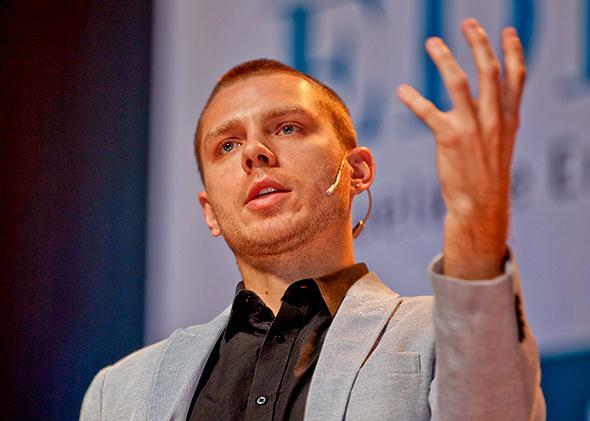 Skylar Tibbits heads MIT’s Self-Assembly Lab. Michael Reilly: You run the Self-Assembly Lab at the Massachusetts Institute of Technology. What does “self-assembly” mean? Skylar Tibbits: In general, self-assembly is a process by which disordered parts build into an ordered structure through simple interactions with each other. For example, we worked with Arthur Olson at the Scripps Research Institute to build a model of the polio virus. If you put the pieces of the model in a glass container, they just sit there. But when you impart some energy—shake the glass—they come together. Shake harder, and it comes apart again. You have these different states based on how much energy you put into the system; you don’t control where every piece goes, it assembles itself. MR: You have combined smart materials with 3-D printing to create “4-D printing.” What is that? ST: At first, the name was a bit of a joke. When you 3-D-print an object, it’s a fixed, static thing. If you want something more complex, you need to print it as parts and then assemble it. We thought, instead of assembling intelligence into it afterwards, why not print intelligence into it? We collaborated with 3-D printing firm Stratasys, which developed a printing material that expands 150 percent when it meets water. That let us print objects that can change over time. Printing isn’t the end; it’s just the start. That’s why we call it 4-D printing. We have done a few prototypes so far—printed a tube that, when you submerge it in water, folds itself into a cube. People are really excited about it, but I think we have barely scratched the surface. MR: A lot of people see 3-D printing as the start of another industrial revolution. Do you agree? ST: Across industry, academia, and government, everyone’s looking at it, but there are still a number of roadblocks, including the speed of printing and limitations of materials. Current materials can’t compete structurally with our existing processes. We need smarter systems and custom algorithms—that’s what the 4-D printing was specifically targeting. MR: You have said size limitation is also a big hurdle. ST: We can’t print big things yet. The example I often give is that to 3-D-print a skyscraper, you would first have to build a skyscraper-sized printer. We are trying to address this with Hyperform, a project in which we use mathematical programs to fold objects so that you can print them on a small printer. Then you can assemble them—by unfolding and snapping pieces into place intuitively—so they are much larger than the printer that made them. But that’s still at an early stage. I think 3-D printing has huge implications for many industries, but we have to overcome these hurdles. I have no doubt that we will, but right now it’s a bit hyped. MR: There is a lot of research into self-assembly on the microscopic scale. But you are working on things we can see, handle, and even live in. ST: Since the Industrial Revolution, we have become really good at making things at the human scale, from cars to clothes to consumer electronics. We won’t try to beat those manufacturing processes. Instead, we will look to outlying scenarios: disaster relief, and areas where we can’t build today because it’s too expensive, dangerous, or hard to get to. We are looking at space construction, infrastructure repair and control systems, smarter consumer products, and U.S. manufacturing opportunities that historically have been outsourced. MR: Will you work on more traditional buildings? ST: We are doing research and design for larger objects. Building construction is much less efficient and more energy-intensive than most manufacturing, partly because it’s a one-off: You only build a building once. It’s also dangerous. So it’s an area where there’s room and interest to develop a new system. MR: What might that new system look like? ST: We haven’t developed applications for construction yet, so it’s hard to say. But I think it would focus on specific systems on the construction site, rather than everything from the ground up. That could be materials that adapt to climate, user demands, or loading conditions; connectors for programmable earthquake response; or components that inform the contractor where they should be placed and how they should be connected. They might even analyze physical constraints that the user cannot see or feel, and that would be hard to compute externally. MR: How could smart materials improve large-scale systems, like water infrastructure? ST: You might have a smart pipe that carries water around a city that, in one state, could close off to become a valve. So it pinches to create higher pressure or to shut off the stream. Or it could expand to allow more capacity, or undulate to move the water, like peristalsis—the wave of muscle contractions that moves food through our digestive tract. MR: Do you look to the natural world for inspiration when designing smart systems? ST: Obviously we are inspired by it, but I am sensitive about not taking the argument that biomimicry is inherently good. I don’t want to be so literal about the idea of mimicking nature, because that’s a trap: If it looks like nature, the thinking goes, it’s good. Or if I just scale it to a different environment, then it will work. That’s not necessarily true—many of the functionalities that nature has built in have evolved for specific reasons under super-specific conditions. Take the grippers of geckos’ feet. That may be a good solution for sticking to things and climbing, but not for certain surfaces or applications. Nature is not always optimal, and it may be a terrible solution for certain environments. MR: Are there other areas where you think smart materials could make a difference? ST: Smart materials could make improvements across aerospace, the marine industry, and the automotive industry, as all of these rely on shape and mechanical actuation for performance. As you drive a car, for example, your performance, the road conditions, and the environment are all changing. If you have materials that can respond to that—better tire grip as you go through turns, change in tire shape to channel water away—that means performance and safety can increase. Or for an athlete, your shoes or clothing could change in response to your body temperature or sweat. Smart materials could be used for anything where shape or material properties could change, but instead of forcing them to change mechanically, you do it through the materials themselves. MR: Do you think smart materials will change the way we engineer systems more generally? ST: The normal engineering approach has been to throw a ton of money at problems to create “intelligent” super-engineered systems. My hope is that over time things become more elegant, so materials fundamentally respond as they need to. MR: What does all of this mean for the future of making things? ST: The production of components is already fairly well-automated, as with industrial robot arms that weld things together, but there are other things that are much more difficult to automate. If we really rethink how things come together, it could make manufacturing more efficient. Automation could mean more distributed systems dump things in one place, then we add energy—agitate, shake, whatever—and they come together.